When I was a little girl (no jokes about the dark ages here)…we celebrated “May Day” on May 1st at our schools. At our May festival we would dance around a May Pole (flag pole) festooned with ribbons. A May Queen would be crowned and we would have parties and games to celebrate Spring. It was a blast. For those of you who don’t know, May Day (May 1st) is celebrated in many places around the world. According to Wikipedia, the traditions and stories surrounding May Day vary from place to place. There is, however, one thing that is similar in most celebrations – the use of Flowers! One of the most popularly known May Day traditions is to buy flowers for someone you love. In Europe, this is a tradition that still reigns. When my Mom had finished her first round of chemotherapy, I promised to take her to Europe to celebrate. We arrived in Belgium a few days prior to May 1st and on May Day we found ourselves surrounded by beautiful flowers. Mom and I celebrated by buying the traditional May flowers called the Lily of the Valley and we enjoyed them in our hotel room for our entire trip. It was a May Day to remember. Why do I share this with you? Stop and thank your family, friends and clients this May Day. Send them a note, drop off a little basket of flowers…but just say hello. I think it is a shame that we have let one of the sweetest of holidays disappear in the United States. But it is always a good time to remember those who make our lives a little sweeter. I count all of you in my bouquet! OK…I DON’T REALLY mean steal…but if you ever wanted to borrow on the equity on your home here are my words of advice – DO IT NOW. Banks are getting ready to shut down lines of credit and these funds will be closed off and no longer available to you. Of course, in a perfect world, you should not borrow against your house at this time unless absolutely necessary but you are warned; we may not see easy HELOC loans or home equity loans for a while. Banks are getting cautious and are pulling back from loans even to owners with outstanding credit. Look for very conservative lending in the future. One last word of advice – hang in there. This market will not last. We can not let fear overtake us. I only hope the lenders get that point as well. If they don’t make loans…they won’t make money. In the buying or selling of homes, there has to be a flow of cash and mortgages on secured property. It is what keeps our economy running! Let’s hope the lenders make it so. March winds blew in more than hot air…it brought us some sales. According to the Orlando Business Journal, sales are up in Orlando by more than 13%. This is great news and a sign that these baby steps might work up a little momentum for us in the Central Florida real estate industry. Hey…any positive news is good news! Well in real estate that pretty well sums it up. Right now, it takes COURAGE! But I want you to know that the market is not dead, homes are selling and there are transactions happening today. It just does not get reported. Apparently, good news does not sell newspapers. However, in all truthfulness, it is a tough market and prices are not nearly as great as 2004-2005. This is not a market for the faint of heart or for the untrained professional. But for those of us who have sold real estate for many years, it is still a great time to be a REALTOR. It is important that you get the whole picture regarding the real estate market. Like all things we have our highs and lows. Right now, we are in a lull. But real estate is still one of the strongest investments for a family and it is still a HOME. I think this is what gets lost in all the news articles. A home is the place where we spend quality time with friends and family and a place of sanctuary. It’s more than bricks and mortars…it is the hopes and dreams of people just like you and me. I thank you for being a part of my real estate family. If I can help you in any way, you have but to call. I’m ready! Purchase price close to buy-out price for Bear Stearns! Just as the financial news is buzzing with reports of the $236 million Federal Reserve-backed bail-out of Bear Stearns by JP Morgan Chase, The Times of London reports that a flat in central London has sold for a record-setting price of between £115 million and £120 million ($230 million to $240 million). By comparison, former financial giant Bear Stearns changed hands at about the same time for about the same price. Who will be the new resident sharing the neighborhood with the Queen and the Prime Minister? The buyer’s name is unreported. “However, you can bet your $2 Bear Stearns’ stock that it is one of the world’s billionaires who wants bragging rights for the most expensive residence,” said Laurie Moore-Moore, Founder of the Dallas-based Institute for Luxury Home Marketing. Eh??? The Canadians are coming! Recently I sold my first house via the internet. The buyer NEVER saw the house, never walked through it, did not have any idea about this home. Wired his closing funds in cash and it was done. Amazing! This buyer just knew it was a good buy and it indeed it was. He saw our internet advertising and made an offer and it was accepted. Where was he from you might ask? Our neighbors to the North must be doing something right since they are moving into buying US properties at a surprising rate. It’s amazing what a strong economy can do and how quickly the momentum can shift from one nation to another. CANADIANS, contact me! I have lots of great properties to sell. I love Canada. I even like your national anthem and the fact that you like the Queen. I have visited your BEAUTIFUL country on numerous occassions and I would be happy to sell you some BEAUTIFUL homes in my country. So enough sucking up…it’s just a reality folks. It’s a big, wide world and we are working a global market. And in the end, that’s really a good thing! 1. Anyone who looks at a home in the rain MUST be serious. I mean this. Almost every year I have sold a house through one of my Open House dates and if the prospect comes out in the rain, I LOVE them even more. 2. The rain makes everything look fresh. It’s true. The driveway looks clean, the ambiance is cozy and inviting and darn it, I love rain. 3. Soft and warm lighting gives the home a glow. In Florida, its sunny most of the time and a home can almost be so bright you have to wear shades. But not so on a rainy Sunday Open House…the lights are on, the candles are glowing and the rooms take on a little warmth where shadows beckon the prospect to sit down. The buyer can envision themselves listening to music and reading a good book while drinking a glass of wine as they listen to the rhythm of the falling rain. It really gives the client a chance to envision their home at night when they will most likely be AT home. So go ahead and rain…you won’t rain on my parade because ANY day is a GOOD day to sell real estate. Rain or shine! According to a recent article in REALTOR magazine, outdoor living spaces are very “in” with today’s buyer. These spaces feature massive fireplaces, TV’s, cook centers and more in an outdoor arena. You only need to visit the parade of homes or a local street of dreams venue to see that where the indoor movie theater has been replaced by elaborate and extensive outdoor living spaces. The indoors have moved outdoors. What’s out? One thing is voluminous ceiling heights. It’s about time this one went out as it is totally non-energy efficient and hard to maintain. The wasted space of a 20-foot ceiling in a 12 by 10 room is the heighth (pardon the pun) of absurdity. What is IN with most buyers? I find that the KITCHEN never goes out of style. The more elaborate the better. Granite is almost expected and any home without it is considered inferior. The stove has really gone upscale and often features a minimum six burners. Gas stoves are back! Most upscale homes have TWO refrigerators and they are hidden with custom cabinetry so you they don’t stand out. This is the new hidden appliance concept. Look for more of this in the future. What do I think is OUT? This one is easy…MEDITERRANEAN styled homes. They are so dated. Builders keep trying to sell us on this Tuscan themed look but it is stale. Note to builders…let’s go back to Americana…what’s wrong with shingle shake exteriors? 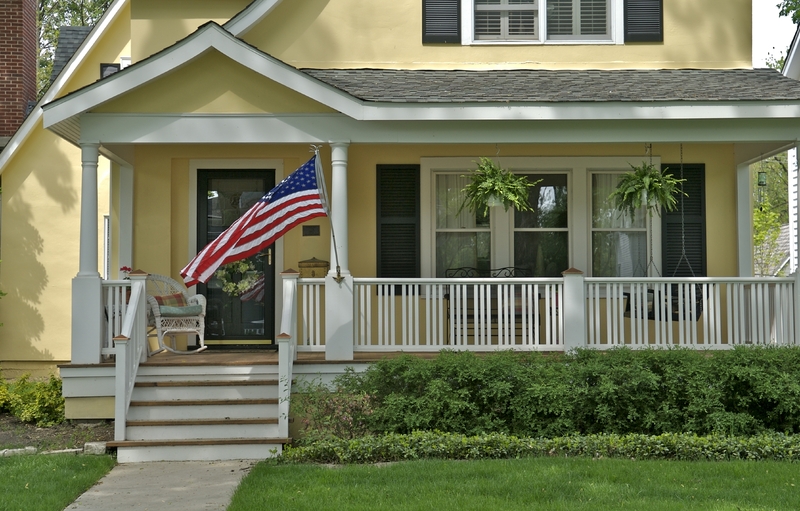 Give me a bungalow or Cape-Cod styled home any day and I’ll show you a buyer. You are currently browsing the OrlandoNest: Orlando's Luxury Real Estate Blog blog archives for April, 2008.